Artist Federico D? ?az is creating a black wave of mutilation with the help of some robots. 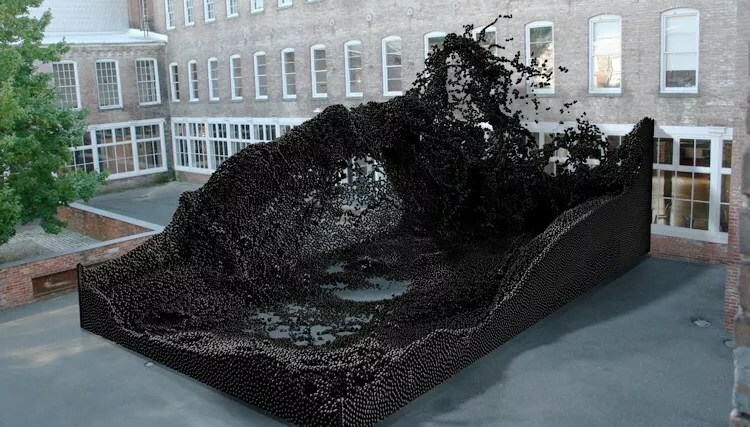 A rendering of the wave is shown here crashing up against the courtyard walls of the Massachusetts Museum of Contemporary Art and, once completed, will reach 20 feet high. The structure comes from the manipulation of pixels in a photograph of the courtyard to a 3D shape. Each pixel is represented by a CNC-milled black ball, and robots are working to assemble 420,000 of them into the final sculpture. Geometric Death Frequency?? ?141 opens on 23 October 2010. One of the robots will be there too!